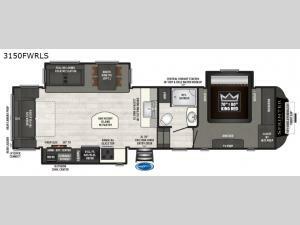 Your family will enjoy extended camping trips with this fifth wheel as your new home base! This floorplan offers dual opposing slide outs in the main living area for more walking around floor space, plenty of seating options to entertain family and friends, as well as a 50" LED HDTV and fireplace for all to enjoy. The third slide out is in the bedroom, where there is also a closet that has been prepped for a washer and dryer if you add those appliances. The cook can enjoy the kitchen island at bar height with a pantry providing extra counter space to prepare and serve meals without having to bend over, and an 8 cu. ft. refrigerator to store your drinks and perishables. You even have extra living space outside thanks to the exterior entertainment center that is prepped for a TV and includes a refrigerator, plus so much more!